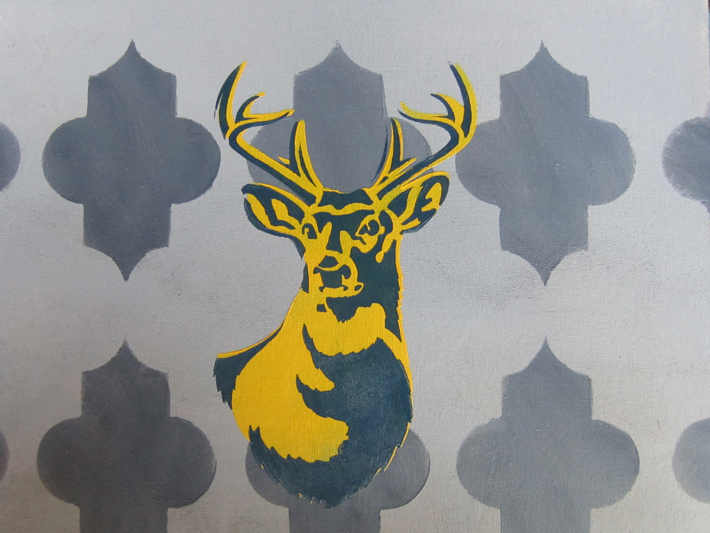 Thank you, Blueprint Social and Plaid, for giving me a chance to play with these great stencils! 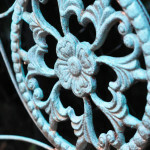 When it comes to crafting and decor, I’m always looking for an excuse to whip up some new art. I love to have a bit of something handmade on the walls. And when I heard about Ed Roth’s new line of stencils, Stencil 1, I was thrilling with ideas of what I could create. 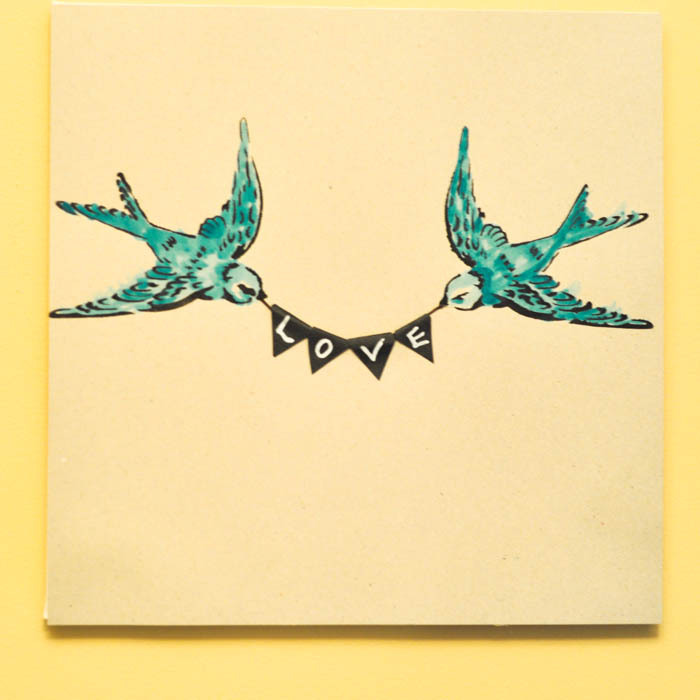 His stencil line is on trend, and features some really fabulous designs. What more can you ask for? 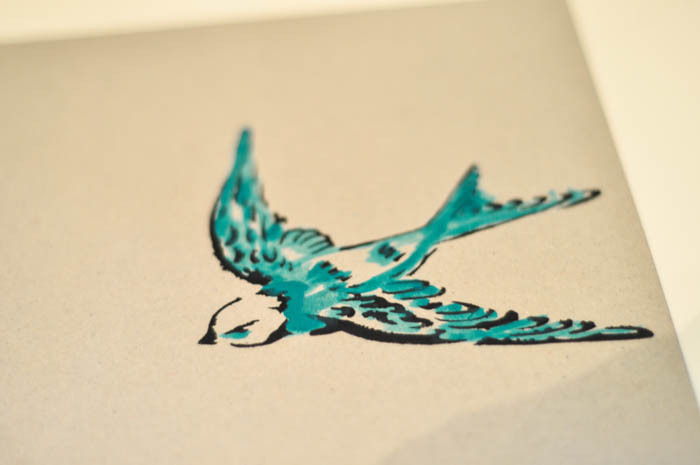 I was sent the swallow stencil. You’ll notice that it has a background as well, should you want to create a layered stencil. But I had a different idea. On a piece of cardstock, I placed the stencil onto one side. Using a paint that was not too heavily laden with paint (blot it on some paper towel to control the amount of paint on the bristles), I “pounced” the paint onto the stencils. When stencils are detailed like this, it’s important to take a bit of time with your work. Be sure that you’ve filled in your lines, but don’t get too excited with the paint. Excess paint will bleed under the stencil and ruin the crisp lines that you’re looking for. 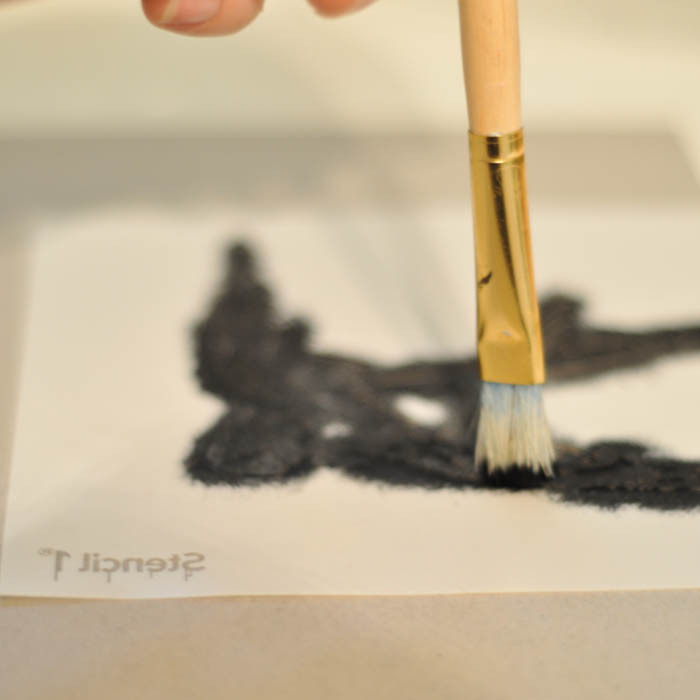 It’s called a “dry brush” technique – less is ALWAYS more. Once the painting was done, I was left with this beautiful little fella. 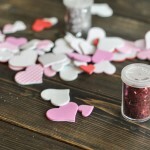 These stencils are made of mylar, so they’re easy to wash up for immediate re-use. I quickly washed off the black paint from this side of the stencil and then flipped it over. I wanted another bird – facing in the opposite direction – to be on the other side of the piece. 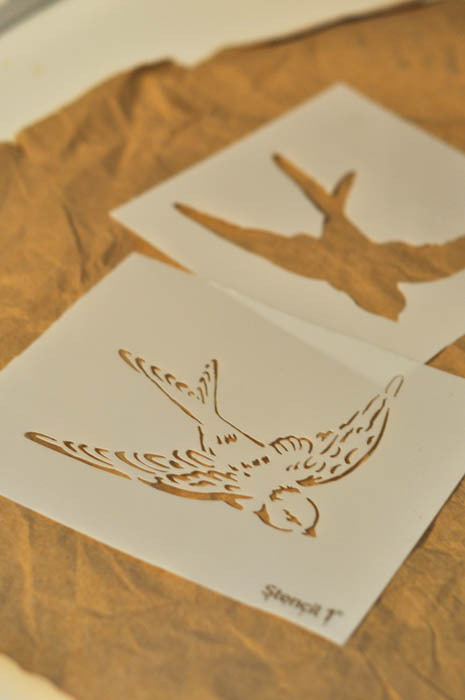 Once the two stencils had been completed and had dried, I got to work with painting the birds. Multi-surface paint is extremely versatile – you can use it on fabric, paper, walls, dish ware and furniture – and you can even play with its vibrancy. 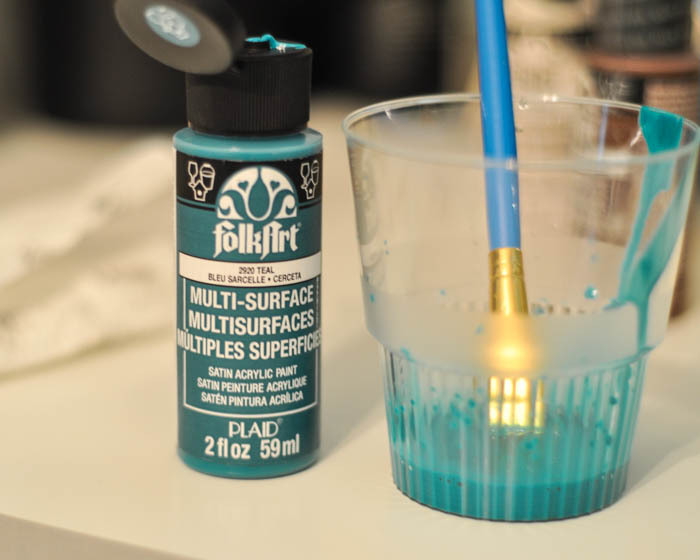 Using FolkArt Multi-Surface in Teal, I set out to achieve a watercolour look, but with the oomph of acrylic. I watered down the paint with approximately a tablespoon of water, and mixed well. Once it had gotten to the consistency I was looking for, I started painting. Using the swallow’s feathers as a guideline, I highlighted different aspects of the bird with the slightly-diluted paint. I tried not to have too heavy of a hand with this step, as I knew that I would be using a different mixture for the body of the bird. Once I had finished the “highlights” of the swallow’s body, I then diluted the paint with nearly a quarter cup of water. I wanted the paint to be just a wash over the bare parts of the stencil. Watered-down acrylic doesn’t behave the way typical watercolour paint does. Once it’s on, it’s on. Water won’t help it to blend or move. So it’s important to use a fine-tipped paintbrush and some patience while you paint. I was thrilled with how my swallows turned out. Yes, there may not be teal swallows darting around our backyard, but I think they look just darling on the wall. To complete the project, I cut little diamonds out of black cardstock and then wrote the word LOVE on their bottom halves. I folded the diamonds over a piece of waxed thread and glued them together to create a miniature piece of bunting. Then I glued the bunting to the swallows’ mouths. I love the simplicity of this piece. The “faux-watercolour” look of the acrylic paint is one that I’m definitely going to use again in another piece. 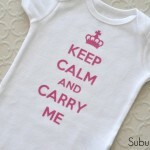 Perhaps this little beauty from the Stencil 1 line? Salvaging a Bench From the Scrap Heap and a Modern Masters Giveaway! 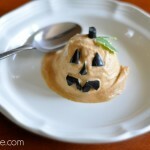 Pumpkin Pie Ice Cream (with a Jack-O-Lantern smile!) & #myfavoritebloggers return! Oh so pretty, the swallows are gorgeous. 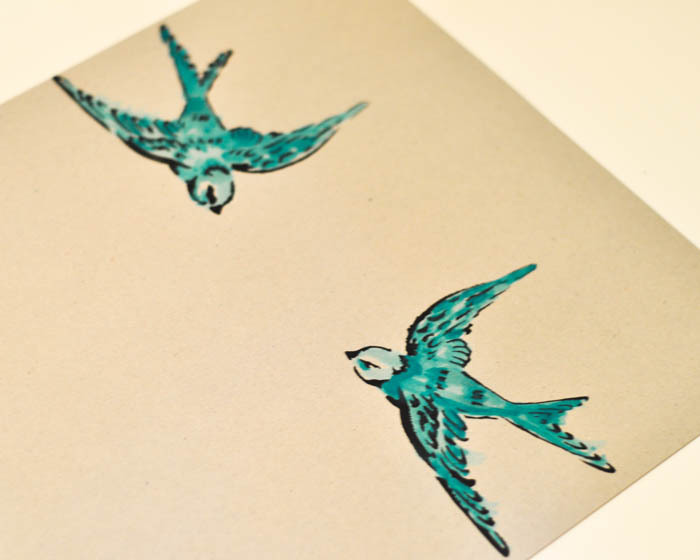 Love Ed Roth’s stencils, and love the faux watercolor effect you did on the birds!! I love Ed Roth’s stuff, too! The water colour effect is one I’m definitely going to be trying again soon! Thank you so much, Meredith! I love how great these designs are. So pretty!! Love using acrylics like watercolors. I’m new to this diluted acrylic medium, but I’m really loving it. It’s such a pretty effect! Those birds are absolutely sweet! Great job painting! Thank you, Virginia! It was a lot of fun! That looks so pretty Tara, that teal is just perfect for them and that banner is oh-so-cute!! Thank you, Heather! 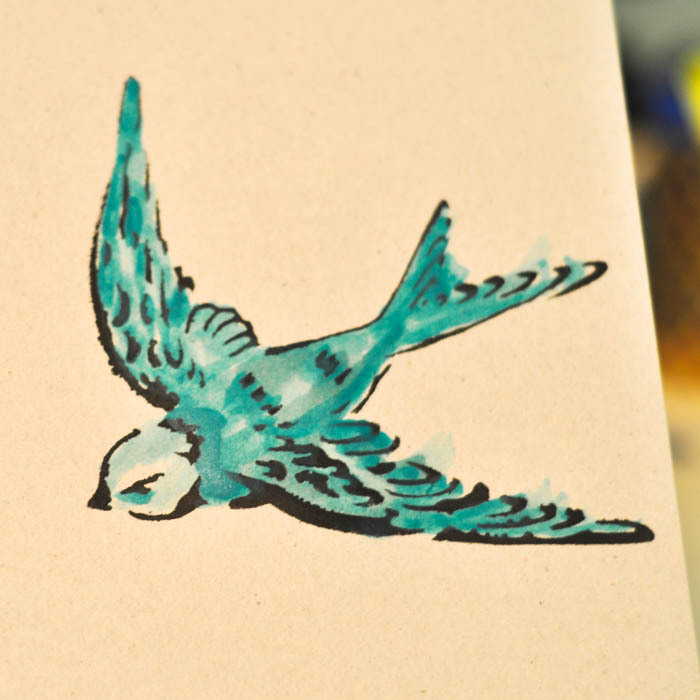 I love the colour too, even if it isn’t exactly “natural” for a swallow! Aww… thanks, Kadie! I’m a big bunting fan too! OMG this is absolutely beautiful, Tara! I love the turquoise color….just stunning! Thank you, Marilyn! I’m really happy with these little birds! Thank you, Kenzie! 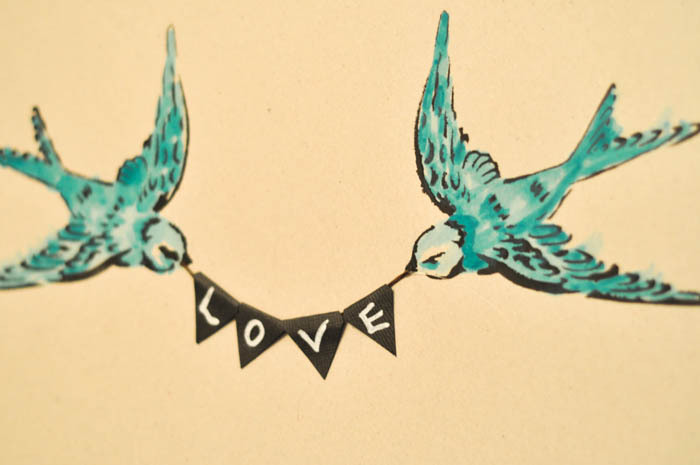 I loved how these little birds turned out! I don’t know why, but I’m always wanting to make more things to put up on the wall! 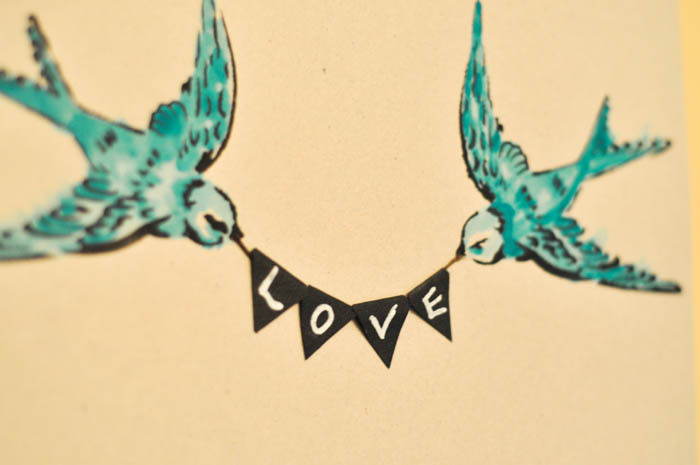 These are super cute stencils! I LOVE that you can get a watercolor look with acrylic paints! Isn’t so fantastic! I found that the acrylic really held its colour, too (unlike a lot of watercolours). I’ll be doing some experimenting for sure! Absolutely love this! So beautiful and you made it look so easy. Perfect to bring a little outdoors inside. You’re so right, Kerrie! And it IS easy! The stencil was a great help in getting this effect. So pretty Tara! The swallows look gorgeous! love the black stencil and with the colour! I love it. Thanks for sharing, I want to pick some of these up now! 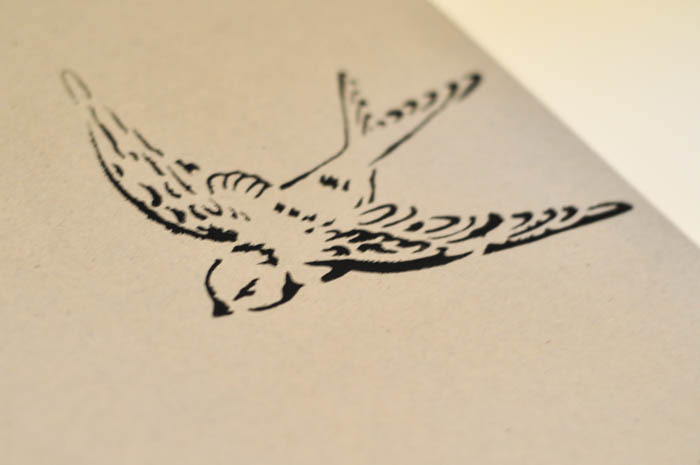 As soon as I saw the stencil I thought, “This would look so cool with a water-colour fill”. It really is as easy as it looks. It’s just all about patience and not going hog-wild with the paint brush (which I so often do!). Wow, this is so beautiful! I would love to give this a try, the swallows are so beautiful! Thank you, Monica! And you should try it! If I can do it, you can! Amazingly simple yet so pretty . 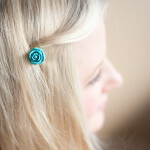 I love this for spring! Thank you, Kim! I was thinking that, too. It’s nice to bring a bit of Spring into the house now. I’m ready for it! That looks awesome. I never thought of watering down Acrylic before, thanks for the tip! I know! I’m so accustomed to using acrylics in their “full force” too, but now that I’ve discovered how wonderfully well they water down, I don’t know if I will ever look at them in the same way! Oh Jodi, I’m sure you could do this! The stencil helped a LOT. And I love making things for the walls – it’s become a bit of an addiction, honestly! Tara, this is amazing! Totally pinning and I must try this. Gorgeous! Oh… thank you, Jamie! It was a lot of fun, playing with the paints!